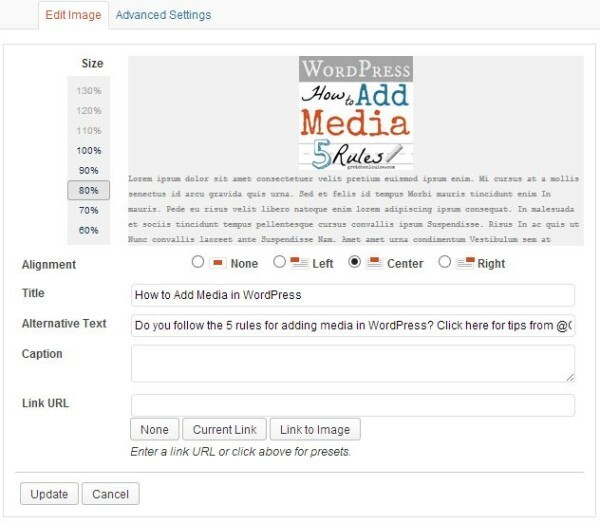 That little “Add Media” button is the secret to adding images (as well as videos and document files like PDFs) in WordPress. 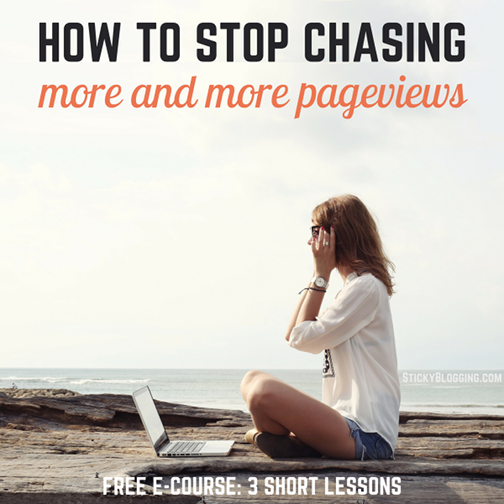 But clicking Add Media before you’re ready, or without filling out the necessary information, can have disastrous results for your site load time as well as for your post’s success. 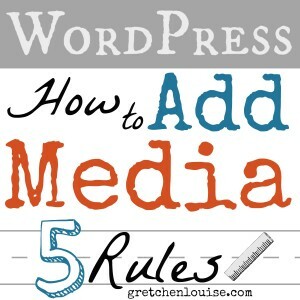 Here are 5 simple rules for adding media in WordPress and other blogging platforms. 1. 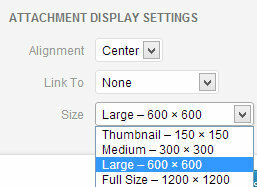 Resize the image before you upload it. 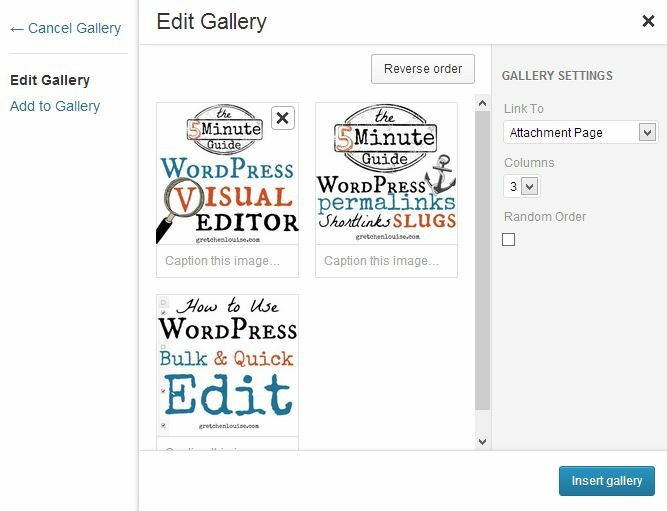 Use PicMonkey, Picasa, or your favorite image editor to resize your photo before you upload it. Why? Full-size images will not only clog your server and potentially make your site run more slowly, but with digital photography, your full-size image is like your original negative. Don’t upload your original, full-size image to the internet. Resize it to approximately 1200 pixels wide and it will still look good on Facebook without hogging your site’s storage. 2. Rename the image before you upload it. 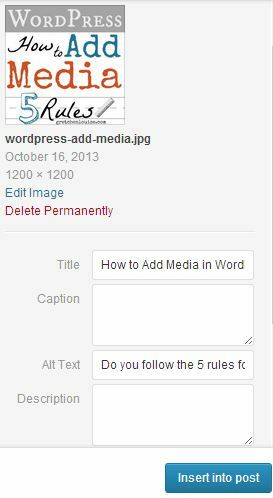 Best SEO practices are to rename your image file with your post name or keyword like wordpress-media.jpg rather than uploading IMG0003.JPG. 3. Fill out the Title and the Alt Text (Caption and Description are optional). The image title and alternate description are your way of telling Google what your image looks like. If you fill them out when you first upload the image, they will be saved with your image in the Media Library. If you edit the image after you insert it into the post, the edits will apply only to the image within that post, not future additions of that image. Title: The Title is what you would actually title your image (think SEO keywords and a logical description of the image), and what displays when you hover your mouse over the image. Caption: The caption is optional. This is what shows below the photo, often in a frame that surrounds the photo. Description: The description is optional. The only place it would usually show is on the image attachment page. 4. Don’t link to the image source or attachment page. Even if you didn’t upload your original image size, you still don’t want to link to the image source. Visitors are less likely to come back to your site if they accidentally click an image file that takes them to nothing but an image page. WPBeginner offers code to change the default “Link To” option to “None”. Rare is the occasion that you’d want to link to the image attachment page. The plugin WordPress SEO by Yoast gives the option to redirect all attachment page traffic to the parent page or post (under Permalinks). 5. Set the Featured Image. Your post’s featured image is its default thumbnail everywhere. For your featured image, you want to choose your best image, the one that represents your post. Click “Set Featured Image” before inserting the image, or click “Set Featured Image” to choose it later. Depending on your theme, your post’s featured image may show as a thumbnail on the archive pages. You can install a plugin like Auto Post Thumbnail to set the first image of the post as the Featured Image, but this can cause issues if you use custom post types like Slides (it also grabs the size of the image as inserted in the post, rather than the full size). Another option is Require Featured Image that won’t let you publish a post without setting a Featured Image first. Edit Image: Did you know? After you insert the image, you can hover over it and click the edit button to change the title, description, link, size, etc. 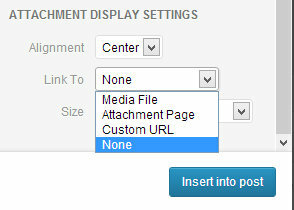 Gallery: You can add multiple image thumbnails to create a gallery by choosing that option once you click “Add Media”. Hi! This was a great post! 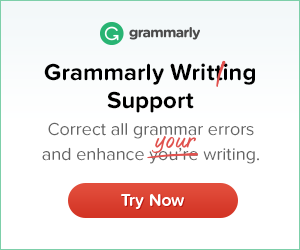 I’m just starting out blogging and as a beginner this was super helpful! 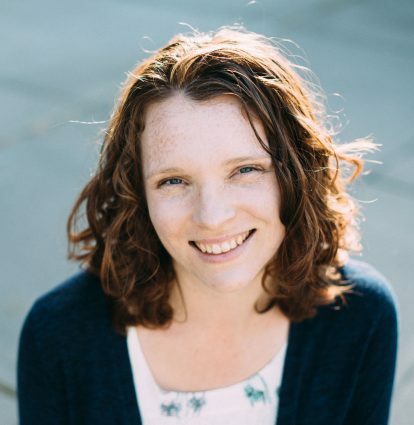 I’m a photographer and writer and want to combine both into a business blog that showcases my work so far to potential clienta but I also want to incorporate how to posts such as photo shop tutorials etc. Do you think that this is a good idea? Loved this article and I learned a lot. Thank you.